If only all of it was cool. 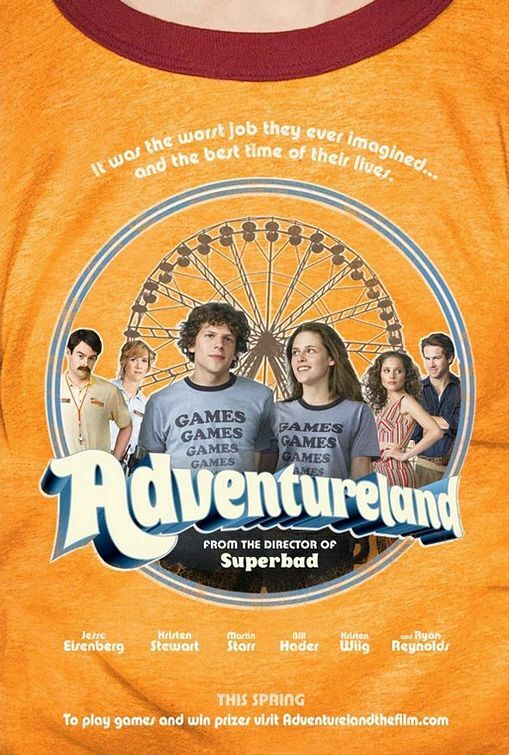 What appears initially to be a goofy off-the-wall comedy in Adventureland is actually something more thoughtful and serious about a boy’s transition into manhood via an amusement park job. Forgoing a slick and slapstick approach the film settles prudently for verbal wit, candid vulnerability and recognizable human heartbreak. For all its efforts to be honestly sincere however the film tumbles into the mundane and neglects to give itself a satisfying pay-off. Taking place in the summer of 1987, James Brennan’s (Jesse Eisenberg, “The Squid and the Whale”) dreams of a European trip is eradicated when his parents withdraw their promised graduation gift fund to their own son. Worse, James’ financial support for Columbia grad school is also in jeopardy. James has to learn to take his future into his own hands. In his hometown of Pennsylvania, the only summer job James can find is as a carny. James, in his wake of diminishing self-esteem, wants to at least operate the rides. Instead he is assigned to overseer ring-toss games and electric horse derby where he has to feign enthusiasm constantly. The documentary-worthy knowledge of carnival games are among the film’s highlights especially in the details of how games are gently rigged. We see James tormented all summer long by irritable patrons who find it necessary to cheat in order to win and by “Rock Me Amadeus,” that’s 80’s pop relic that booms from the park’s loudspeaker. A love story takes precedence however when James falls for Emily (Oh no, Kristen Stewart from “Twilight”), a sharp-minded and sexually active teen with parent distrust issues. James starts this relationship by accepting rides home with Emily, then they go out for drinks, then they go to a party, then they finally kiss. They get somewhere halfway romantic together. Yet Emily always remains at a bitchy arm’s length. Perhaps Emily is still into Mike Connell (Ryan Reynolds, “Smokin’ Aces”), another carny who is a rockaholic on his off-time. Mike is married, but Emily doesn’t care. Mike is unhappily married, you see, and his projection of hunky non-chalance is attractive to a young girl like Emily. Mike is approaching his late twenties and knows that he’s in low wage oblivion. Mike wants Emily for selfish ego-pumping reasons. Mr. Sensitive James wants Emily for pure love but his handicap is that he is an inexperienced virgin. Youthfulness often lends itself to social awkwardness and “Adventureland” has plenty of these moments. Eisenberg, as our hero, is just a shade more confident than his Hollywood doppelganger Michael Cera as the nerd who tries really hard to fake cool. Eisenberg’s naive eagerness in the part lets him outshine his co-stars. Stewart is moody and relies on too many of her own familiar tics. And Reynolds is perfect for the character as the aging cool guy who is really lost in a crowd too young and beneath him, but Reynolds never really flies away with the part like he should. Somehow some of the lesser players are more engaging, like Martin Starr as a glasses-rimmed nerd who recites Russian literature passages to girls as a quasi-sophisticated come-on and Margarita Levieva (pic, right) as a bubble gum babe who dances the Roger Rabbit. The bonus attraction are Bill Hader and Kristen Wiig (“SNL” veterans) as whacky amusement park owners. These two are the only archetypes in the film, but really their roles have brief playing time. Gag sights of inebriated youth puking and punches to the groin aside, the film (written and directed by Greg Mottola of “Superbad”) strives to replicate the smart and zesty dialogue-driven appeal of Richard Linklater’s youth pictures (“Slacker,” “Dazed and Confused”). But “Adventureland” only sporadically succeeds as a Linklater imitation. Furthermore, the vibe of the film is too mellow and sedate when it should crackle. It is possible I would have been more enthusiastic to recommend it if Kristen Stewart hadn’t been in the role. I’m left limp and without a true emotional connection when she’s on-screen. Film Cousins: “Summer of ’42’ (1971); “Carny” (1980); “Valley Girl” (1983); “Say Anything” (1989).